Atlas Air (New York) has signed an agreement to operate a VIP-configured Boeing 767-200 passenger aircraft in CMI service for MLW Air, LLC. Flights are expected to commence this summer. Under the new CMI (Crew, Maintenance, Insurance) agreement, Atlas Air will operate MLW Air’s unique, all-first class, 102-seat Boeing aircraft, extending Atlas Air’s innovative CMI service solution and its growing 767 aircraft platform into very high-end passenger transport. The flights will be marketed as charters to sports teams, entertainers and other high-profile users. 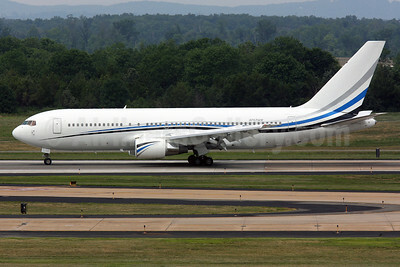 MLW Air’s Boeing 767-277 N767MW (msn 22694) is the only all-first class 767 commercial charter aircraft with worldwide operations registered with the Federal Aviation Administration. The dual-aisle plane features first class seats with 60-inch pitch (the distance between a row of seats) in a two-by-two-by-two configuration. The seats recline to 156 degrees for maximum comfort and come with adjustable head and foot rests. The plane is ideal to meet the needs of heads of state, celebrities, diplomats, professional sports teams, entertainers, private parties, tour groups and other charter needs. The client list includes the Dallas Stars and Dallas Mavericks and such entertainers as Bruce Springsteen, the Rolling Stones and Beyoncé. Atlas Air currently operates 10 Boeing 767s, including three passenger aircraft and seven freighters. Its modern, efficient fleet also includes two VIP-configured Boeing 747-400 passenger aircraft, 37Boeing 747 freighters and a recently acquired Boeing 777 freighter. Copyright Photo: Brian McDonough/AirlinersGallery.com. Pictured arriving at Washington (Dulles) with the Manchester United team on July 28, 2011 when it leased to Swift Air, the former Ansett Australia (VH-RMF) and Gadair European Airlines (N767AT) wide body 767-277 will now be operated by Atlas Air for MLW Air as N767MW. This entry was posted in Atlas Air, MLW Air and tagged 22694, 767, 767200, 767277, Atlas Air, Boeing, Boeing 767, Boeing 767200, Dulles, IAD, MLW Air, MLW Aviation, N767MW, professional sports teams, Swift Air, Washington on June 21, 2013 by Bruce Drum.